After a few nice sunny periods in the last few days once again the clouds have hovered around and delivered showery rainy conditions which have provided Taupo with perfect fishing conditions. All rivers are now back to a lovely fishable level and some still hold some great colour which should tip the scales in the favour of the angler. The Hine has had very little pressure on it over the past two weeks and those who have wandered up from the bridge have had a few fish to play with but they seem to be fairly coloured fish in here now. This river certainly compensated for other rivers this winter and fished absolutely fantastically so I wont have a bad word to say about this little gem for a few weeks yet. The Waitahanui has been high for some time now and it has been a long time since I have seen water hold so high in here due to the lake now being filled to the brim. High water is a good thing in my opinion as it may help the fishing in the summer a wee bit but also gives the trout a chance to escape the anglers and get up high to spawn and complete the cycle.The straight has received a hiding from mother nature over the past month and has been dramatically shortened which I think is a great thing as it may deter some of the locals from giving it so much pressure day and night. It will take a while for the picket fence to again straighten and head out to the lake but when it does it will beÂ in a better place to draw in bigger numbers of fish when the conditions are right. At the moment most of the rip seems to be running along the lake towards Taupo but as the lake level drops in the next few months it should straighten and again become a great meeting place for young and old to cast and catch up. 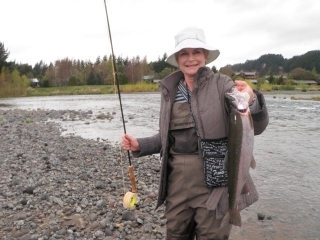 The Tauranga Taupo after weeks of high water again looks very fishy and is currently at a great level to explore and see what has changed in the recent floods. This river seems to forever be changing and forming new snags and indeed new pools so one has to be on the ball to really know this river well. The car park has been half full most mornings and I can only assume that some good fish have snuck up in recent weeks. Unfortunatley I have no reports and can’t find any info on what has been going on in here so either a select few are onto a good thing and keeping it quiet or things are hard going in here? As usual the Tongariro has surprised me and just when you think things have quietened down or you are loosing your touch this mighty river delivers the goods and your thoughts totally change. Earlier in the week I had a couple of days with good angler Phil Norman and found the river to be fairly hard going all over. As you know we fished everywhere from the Blue pool to down below the braids and only picked up the odd fish here and there. Well I’m sorry Phil but ever since you left total beginners have been getting stuck into fresh fish and having an absolute ball with very small pulses of fish which are trickling through consistently. The river is still in perfect condition and by fishing heavy in the deepest of pools with a trailing glo bug has picked up some stunning fish over the past two days. 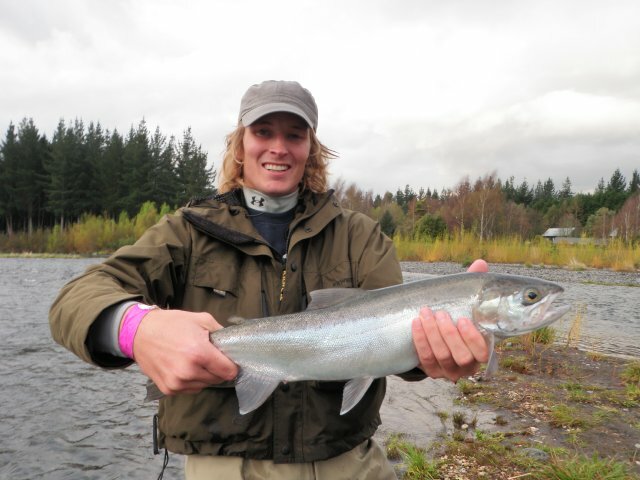 The fish that have been kept have been very good fish well above the average size and have been sporting bright orange salmon like flesh which we all hope for when killing a trout for the table. Some anglers are still crying poor while not hitting any fish but if you keep moving the odd are you are going to run into these guys. If you study the photo’s posted of happy clients here and fish you will soon work out where these trout are being taken from. It has really been good fun guiding the last two days and these sort of clients make my job such a good and satisfying job. I was constantly kept in stitches of laughter by these three Irish lads and I’m sure half of Turangi was laughing at their ability to cast but as you can see Irish luck kicked in and they had the last laugh. 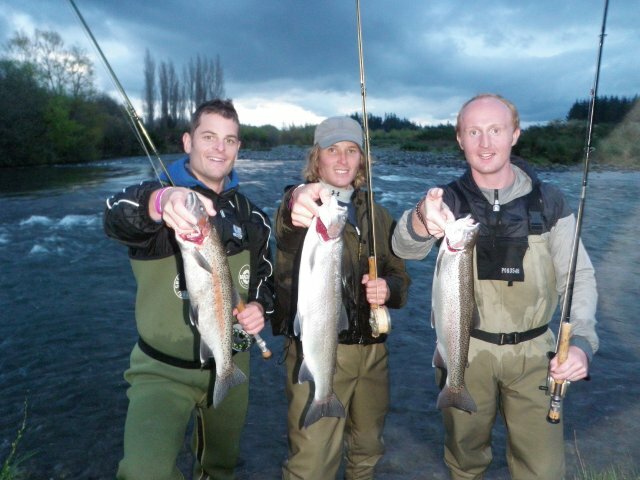 Everyone has different expectations and believe me when I say I have seen them all but these guys were just happy to get the fly in the river and enjoy each others company while trying out a sport that in the pat they could only watch on TV or read about in books. Being apart of landing that first fish was priceless and I actually made myself nervous while skipping down the rocks screaming instructions at poor Christin who by then had two other Irish boys right behind him taunting him not to loose it-great afternoon. Those of you who were in the braids and heard the celebrations of these lads they send their apologies for wrecking the serenity. This morning was also great to be apart of and there’s nothing better than hearing from your clients that they don’t expect to catch anything but they just wanted to see what fly fishing was like-wash your mouth out we will be catching something!! Lindsey and Denise are from Queensland and had been experiencing some lovely NZ weather from the day they arrived and today did not let us down with constant drizzle and overcast conditions. Neither new which end of the rodÂ to holdÂ but they both managed to hook and land fish in the braids early this morning with a little bit of coaching. When we arrived there was a fishing meeting in spot x which consisted of eight hopeful anglers whipping the water so we had the rest of the braids to explore and learn the skills of casting and water loading. The entire braids was free along with the Plank pool and the Bain pool so why were they all banked up in spot x!!! Anyway it was not long before we were leaving the braids with two lovely fresh fish which they both picked from the bypass of the Honeypot using a orange glo bug. A photo says a thousand words and I feel sure Denise will be telling the yoga class back home the Â story of the huge angry jack which pulled here down the rocks on the mighty Tongariro for some time yet. The official opening of the backcountry rivers kicks of tomorrow and I’m sure many of you and your mates will be heading deep into native bush in search for plenty of trout which have not been touched for months. 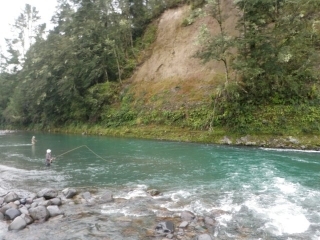 I have postponed my clients which were heading into the headwaters of the Whanganuie as I have a feeling that the river is to high for both access and good fishing.Â I’m not sure what the rest of you think but I seem to have hard fishing when backcountry levels are high or dirty so instead of risking disappointment weÂ have planed for another time when I feel sure it will be a success. There will be heaps of rivers out there will be fishable and will fish very well and I look forward to hearing some positive stories over the weekend. 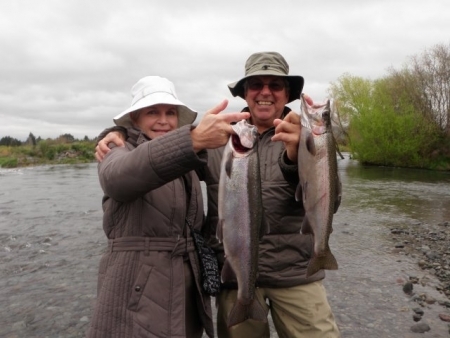 This might be a good weekend to be on the Taupo rivers as many may decide to leave it alone and hit somewhere different for a change?